In this post, 34SP's archivist Anne Kumer shares some 34th Street history. This post also appears on NYC Circa, Anne's history blog about New York City and its public spaces and buildings. Penn Station, neighbor to the still standing Farley Post Office is mostly remembered as one of New York City's great losses. 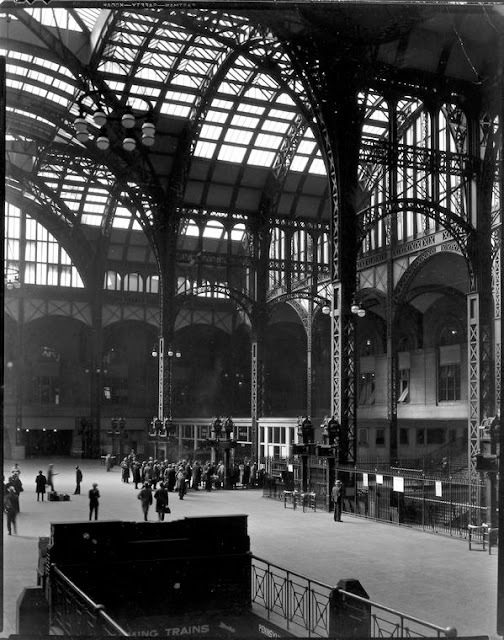 The photo below shows the station as most choose to remember it -- a beautifully designed structure filled with natural light, that makes train travel look like the best idea ever. For out-of-town travelers new to the city, it was often their first glimpse of New York City. Before Penn Station was conceived of and built, railroad service terminated in Jersey City on the western side of the Hudson River. From there, passengers boarded a ferry into the city. The Pennsylvania Railroad Company (PRR) put forth several proposals to bring service into the city, including elevated tracks over the Hudson. 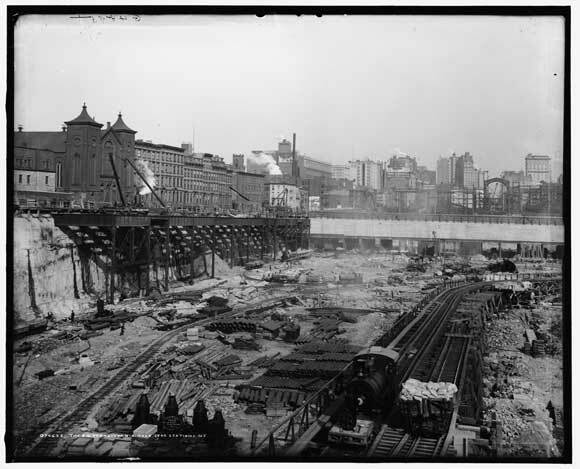 It was eventually decided to tunnel under it instead, and an initial excavation began on July 21, 1880 to link the new passage with an existing, partially completed tunnel. 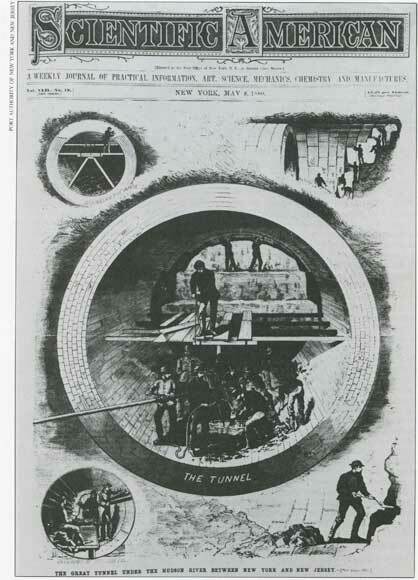 Unfortunately this effort ended in disaster for several workers who perished when the tunnel collapsed. The disaster cast a shadow on the project, and it wasn't until twenty years later that PRR President Alexander Cassatt, announced plans to resume the project, tunneling under the Hudson and into the City at West 34th Street. Architecture firm McKim, Mead & White was chosen to design the station; construction started on May 1, 1904, and was completed in 1910. September 8, 1910 was the official opening day of the station, though full train service didn't begin until November 27, 1910. Known for their Beaux-Arts style, McKim, Mead & White placed Doric columns along the eastern facade, crowning them with twenty-two eagles. The form used for the eagles was sculpted by Adolph A. Weinman. The station had high vaulted glass ceilings that let in natural light and lent a refinery to the terminal, almost as if it was a museum devoted to transportation, rather than just a terminal. 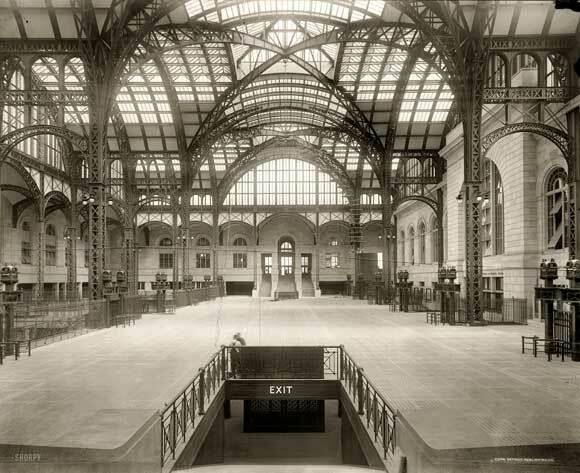 This feature of the building also likened it to another architectural jewel that burned down years before, the Crystal Palace exhibition hall, built mostly of glass and steel and erected in Bryant Park in 1853. Like all good architecture photos, this one is entirely without people. With the increasing practice of traveling by car in the 1950s, the railroad industry began to suffer financially. 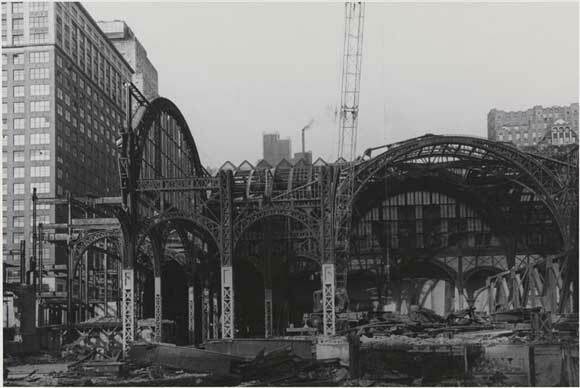 The station and air rights were eventually sold and plans for the new Penn Station and Madison Square Garden were announced in 1962. 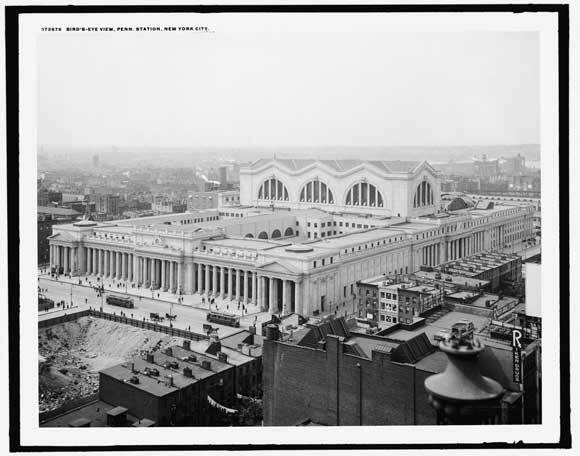 In exchange for optioning out the air rights over Penn Station, the PRR was permitted a new station underneath the future site of MSG at no cost to the railroad company and a 25% stake in the new MSG sports complex. Destruction began on October 28, 1963. The following photos are housed at the Museum of the City of New York, and were taken by one of my favorite living photographers, and I'm fortunate to say, friend, Aaron Rose. 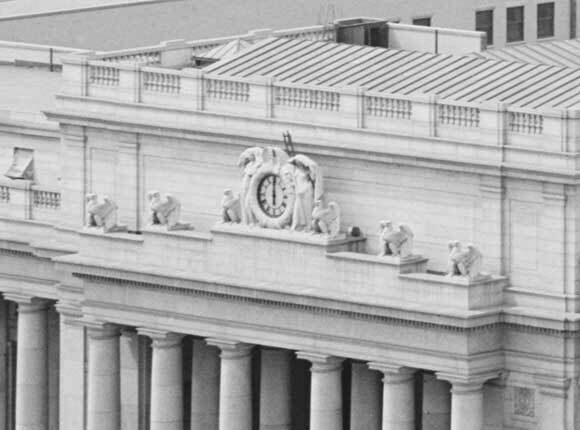 The public outcry against the destruction of Penn Station was significant, though not enough to save the building. 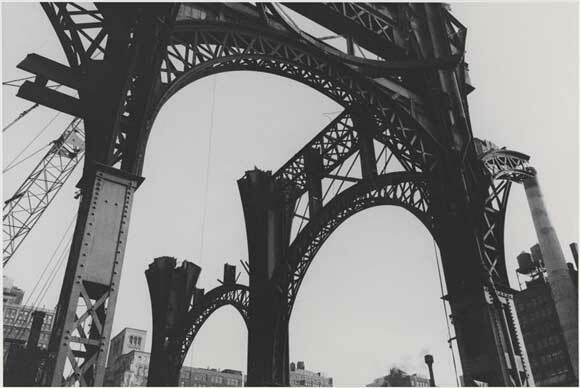 It did however, help solidify and unify architectural preservation efforts, and led to founding of the Landmarks Preservation Commission (LPC) in 1965. I would be a much happier person if I commuted into the old glorious Penn Station instead of the [expletive deleted] my train takes me to every workday. Thanks for introducing me to Anne's site. Lindsay - Happy to introduce you to Anne's site! I'm so lucky to be able to tap into her talent and knowledge. When I first looked at all these photos together, I wanted to weep. Thank you so much Lindsay. As a fellow sewer, I'm loving your posts on Shop the Garment District!